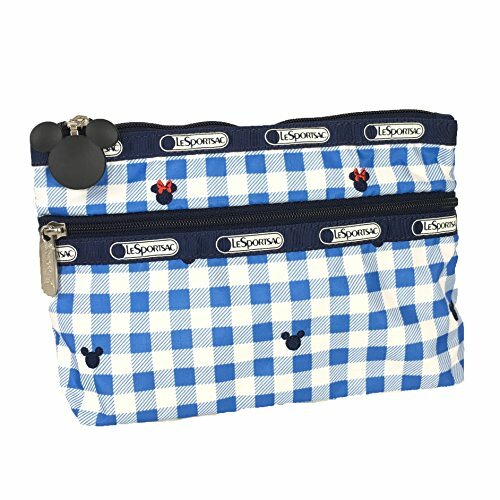 LeSportsac x Disney Minnie Mouse Cosmetic Clutch Zip Bag, Checks & Bows | Accessorising - Brand Name / Designer Handbags For Carry & Wear... Share If You Care! This durable, wipeable cosmetics case from LeSportsac is the perfect accessory for tucking into your bag when you’re on the move. With its exterior pocket for keeping small essentials organized and close at hand and its roomy interior, you’ll be able to pack all your glam gear without muss or fuss. Durable, wipeable cosmetics case in printed nylon. Limited editition picnic blanket print that features the classic Mickey and Minnie silhouettes. Exterior zip pocket. Mickey Mouse charm zip pull. Top zip closure. Lined. 8.5″W x 6″H x 2.5″D.